In 2017, Publix ranked No. 6 on Fortune Magazine’s 2017 Best Workplaces for Diversity. At Publix, diversity is a big part of our culture, so much so that part of the Publix mission is to be involved as responsible citizens in our communities. “We want our associates and their unique abilities to reflect the communities we serve, and persons with disabilities are a vital part of that segment,” Nicole Maristany Krauss, Media & Community Relations Manager for Publix told us. “We work to provide an inclusive environment for all our associates, and we are proud of the diversity that exists in our Publix family.” Our associates with disabilities have big personalities and each one brings their own strengths to Publix. Let us share stories of a few of our exceptional associates who have overcome adversity and obstacles to shine with us. Tyler has been a part of our Publix family for five years. He was born with Down syndrome and lives with his mother and step-dad. His family is very involved in his life and started a nonprofit special arts theater that focuses on keeping the arts alive and well for all people. Tyler goes to work every day ready to do the best job he can. He proudly wears his smile and has a way of making people appreciate one another. Without Tyler, Store #1335 wouldn’t be the same. Sara has been a part of our Publix family since July 2005. She has always had the desire to work for Publix and turned down other job offers while waiting for the opportunity to become part of our team. She loves customers and strives to make Publix a better place. Her management team says that she works hard to be the best she can be every day while taking pride in her work. In the summer of 1999, Sara was invited to join the USA Women’s Soccer team for the Special Olympics World Games in North Carolina. Herteam came in second place and received the silver medal. We asked her management team how Sara has affected their team. Their response was, “Sara’s kind personality really rubs off on our team. When she is here you can see a difference in everyone. Her smile is infectious. The customers look forward to seeing her because not only is she friendly, but they also see how hard she works.” They went on to describe her as a very kind, giving associate. She loves to dance and be happy. We appreciate Sara’s dedication to Publix and that she strives to follow all guidelines and encourages others. It is associates like her who make our team whole. John was born at Duke University Medical Center in 1971 with severe Cerebral Palsy, and doctors said he would never be able to walk, talk or function properly in day-to-day life. His adopted mother has an amazing story to tell about his life journey that ultimately led to John defying all odds. He is now an avid swimmer, bowler and volleyball player in the Special Olympics, where he has won many medals. 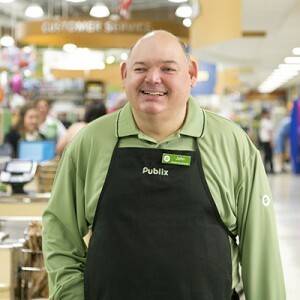 John started his career at Publix in August 2003 as a part-time front service clerk (bagger). His daily responsibilities include providing premier customer service to everyone he comes in contact with. He performs these duties quite well, always with a smile on his face. We asked store manager David Grassick to tell us a little about working with John over the past nine years. David said, “John has an ability to touch those he works with through his personality. He is outgoing once he gets to know his fellow associates. He has a warm heart and a special personality. He has touched many people who have worked here at our store, along with customers. We hope these stories brought a smile to your face just as they have for us. 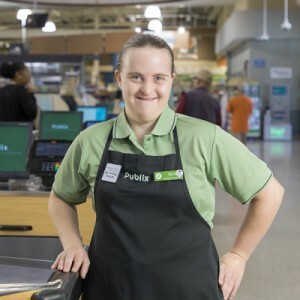 Publix welcomes people with disabilities to apply and gain meaningful employment. We’re proud to be part of Fortune Magazine’s 2017 Best Workplaces for Diversity, and we will continue to strive to be a place for everyone to work and shop. This melts my heart! Being part of a caring family is one of the reasons I love working at Publix. Tyler, Sara and John, you are all my heroes!